Don't be afraid, be terrified! 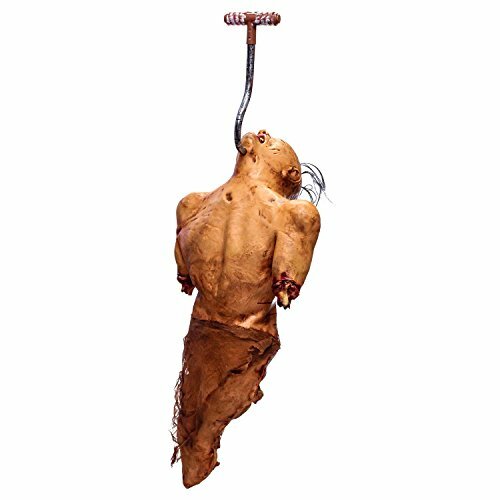 A terrifying life-size mutilated bloody zombies torso that's hanging from a meat hook in his chin. His body has been severed below his waist and arms have been bitten off. This horrific mutilated zombie man's arm bones are exposed out of the bloody skin. This non-animated latex prop is a truly gory site to see. This mangled zombie man that measures 4 feet from the top of the meat hook in his head to the end of his bloody guts torso and has 18 inch wide shoulders. Don’t be afraid, be terrified! A terrifying life-size mutilated bloody zombies torso that’s hanging from a meat hook in his chin. His body has been severed below his waist and arms have been bitten off. A professional high quality life size human male zombie torso prop decoration that’s made with poly-foam filled thick rubber latex that’s been gruesomely sculpted into a realistic looking tortured soul. This horrific mutilated zombie man’s arm bones are exposed out of the bloody skin. This non-animated latex prop is a truly gory site to see. This mangled zombie man that measures 4 feet from the top of the meat hook in his head to the end of his bloody guts torso and has 18 inch wide shoulders. It’s sure to add a bit of scary desperation to your Halloween decor, as it’s a perfect horrifying addition to any haunted house, graveyard or entryway! This one halloween decorations is going to be the start oof your halloween party. They will hate it so much because of the terrifiying scene it will make. This is how this halloween decorations is the most popular for the host, but also unpopular halloween decorations for the guest!